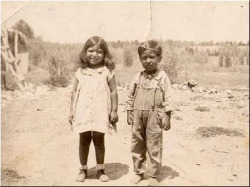 Cesar Chavez was born in Yuma, Arizona on March 31, 1927. When Chavez was 4 years old his family’s farm was taken because they did not pay their taxes. They were not able to pay taxes because of the Great Depression. Before they lost the farm he worked feeding and watering the animals, picking up eggs, and bringing water to their house. Cesar did not like school. He quit school after the eighth grade. When Cesar Chavez was 17 years old he joined the military. He wanted to help defend his country. He left the military when he was 19. In 1948, Cesar married Helen Fabela and they had eight children. Cesar died on April 23, 1993 and was buried at 29700 Woodford Tehachapi Road in Kern County, California. 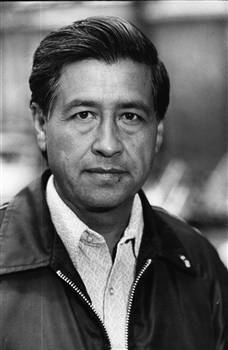 Cesar Chavez was hired and started working with Fred Ross at the Community Service Organization in 1952. The Community Service Organization worked to help people. They wanted community leaders to respect everyone in the community. They also helped people register to vote. 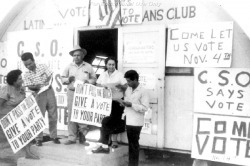 Cesar started the National Farm Worker Association. This group worked to make things better for farmers. All different kind of people joined Cesar. He and the other workers wanted farm owners to take better care of their workers. He thought they needed fresh water, bathrooms to use, and a fair amount of pay. Some of the workers were hurt because of their work. He did not agree that people should hurt each other. He also made many speeches in support of workers' rights. Chavez led a strike against California grape farmers that lasted almost five years. 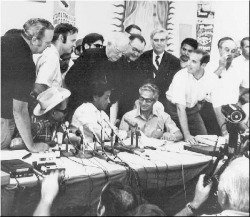 He also inspired Oberos Unidos and Farm Labor Organizing Committee. Cesar led a boycott to protest pesticides on grapes. Then in 1969, Cesar was imprisoned for challenging a boycott. Chavez fasted for 36 days in 1988 for another protest. Throughout his life he faced lots of discrimination. When Cesar was very young his family’s farm was taken away, and they had to move. He had to go to a lot of schools. Cesar didn’t like school because he was not aloud to speak Spanish. If he spoke Spanish, he would be punished. Cesar only got to go to the eighth grade because his father got in a wreck and he had to go to work. -Cesar attended about 30 different schools in his childhood. -Chavez was a vegetarian all his life. -He also fasted for 25 days to support the U.F.C.